Maplelea Doll Saila – Meet the Newest Small Friend! Maplelea’s beautiful Saila doll has joined our 18 inch Small Friend family! I was thrilled when I heard that Amazon.com is now carrying Maplelea dolls, doll clothes, and accessories. Maplelea is a Canadian doll company, and although they will gladly ship to US customers from their website, international shipping is (understandably) quite expensive. I’ve had my eye on Saila for well over a year, and when I found out I could order her through Amazon (with my 2 day Prime shipping, What WHAT? ), I knew she’d be my next doll purchase. 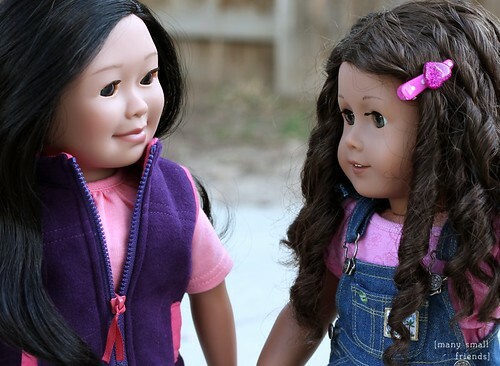 Like American Girl, some of the Maplelea dolls have specific names and stories while others are non-specific “Friend” dolls, leaving naming and back story to the doll’s new owner. Saila represents a modern girl with Inuit heritage. I love the uniqueness of this doll! It’s easy to find a dancer, or a girl who loves horses, but a girl who is bilingual and speaks Inuktitut and English, wears a Pang hat, and prefers to travel by snowmobile? Sold. I missed the first batch of Saila dolls, which sold out quickly after the initial announcement about Amazon availability, but I managed to get her on the next restock. As of this writing, she is sold out again, but the last restock took just a few days and I imagine she will be available again soon. UPDATE: Saila is in stock again at Amazon! Maplelea and American Girl dolls can share most clothing, but Maplelea doll feet are larger then American Girl feet so most AG shoes are too small. I’m very impressed with the outfit Saila arrived in and I’m excited to add more Maplelea clothing to my dolls’ wardrobe. The dolls, clothing, and accessory prices are comparable or a little less expensive then American Girl and some of the Maplelea accessories seem like a downright steal. I’m very curious about the Popup Tent , for example, which is currently retailing for $20.00 on Amazon! My next Maplelea purchase will definitely be the High Country Hiking Outfit . I’m especially enamored with the Rocky Mountain Wildflowers tee, since we live right at the foot of the beautiful Rocky Mountains. We must have that tee. And I’d really, really, really love it if Maplelea would add Saila’s Amazing Amauti to the Amazon line-up. Although I have no doubt it’s worth every penny of it’s $56 price tag (it is made in Nunavut according to traditional design. Swoon), I just can’t swallow international shipping on top of that. UPDATE: Saila’s Amazing Amauti *and* her Pang Hat have both been added to the Amazon catalog. Three cheers! Only a portion of the Maplelea catalog is currently available on Amazon, and there aren’t many reviews posted yet. I will be curious to see the US customer response to these Canadian girls over time. Saila is an absolutely beautiful doll and I’m delighted to add her to my collection. I made a short unboxing video (although I cheated and removed the plastic ties beforehand to save time). There are more pictures of this gorgeous girl at the end of the video. *Edit: It was kindly pointed out to me by a YouTube commenter that I mispronounce Maplelea in the video. Ooops! The correct pronunciation is “Maple-Lee”. And now you know that I am the only person in the world that didn’t know that. Ha ha! Do you collect Maplelea dolls? I’d love to hear which doll or accessory is your favorite and what (if anything) is on your Maplelea wish list. This entry was posted in Doll Photography, Doll Review, Doll Video and tagged 18" Dolls, American Girl Dolls, Doll Video, Maplelea. Oh, you’re right.. that Clam Digger is sweet! I love LOVE the pic of her in the red hooded coat on your site. And I totally agree about photographing Saila, it’s just a matter of angles and lighting. She photographs *beautifully* with that pale vinyl (skin. lol) and dark, shiny hair. Love her! Lovely review. I currently have Leonie also purchased through Amazon. I love her yet you’ve certainly tempted me with your pictures here! I’ve been thrilled with all the clothing so far, the attention to detail is fabulous and like nothing else I’ve seen – it truly seems like very well made people clothing shrunk down… 😉 I hope Maplelea will continue to sell through Amazon, it is a terrific way for the company to become more well-known. Yes!! I haven’t ordered another outfit yet, but I must have that High Country Hiking outfit. Must. lol. I’m SO impressed with Saila’s meet. You are right, the quality is absolutely as if the clothes were for real people to move and live in. SUCH an impressive company! You mentioned that AG shoes don’t fit Maplelea-how well do the Maplelea shoes fit AG? Just wondered if they are way to big to the point that they won’t stay on, or just slightly too big. They have some really nice stuff that I’m curious about. She’s a pretty doll, I can see why you wanted her! Thank you for that nice review video. I fell in love with her on the Maplelea website. I noticed in the website description that the doll came with a keepsake storage box so now with your video I realize what they mean (the dolls are shown in an open box on the website so I thought that is how they came with like a cellophane lid). Her journal is really cool, too. I will be saving up for her. It really is a NICE box! LOL.. sounds so geeky to get excited about the box, but it’s kind of awesome. 😀 Thank you for checking out my video!